For me, the holiday season is a memory-making season. Most of my favorite childhood and family memories come from this time of year. Maybe that’s true for you too, or perhaps your memorable moments come from other times. No matter when, memories live all around us, if we take the time to look for them. As a young father, I’m very aware of the memories my children are building every day. I hope they are as positive and lasting as possible. And so, a simple message for this final post of 2013, regarding memories. Your fraternity years, your sorority years, your college years - these years can be some of the most memorable in your life. There are countless moments throughout these years that will stick with you. Forever. And the people in these moments will stick with you as well. Because of this, my recommendation to you is to slow down, stop, and to fully appreciate these years for the memory-making potential they have. Maybe linger a little longer in that conversation with a brother. Maybe say yes to that trip with your sisters. Maybe wake up a little earlier, stay out a little later. Be more open, more respecting, more willing to trust, and more vulnerable. Yes guys, you too. Let the camaraderie be palpable and thick. Let the laughter boom through the halls. Let the tears flow if they must. Weave a story that makes your eyes shine when you share it. If you are just drifting through this experience then I invite you to wake up and look around. You will only pass this way once. Just as my middle child will soon experience Christmas as a 3-year-old for his one and only time, you will never again have these college years back. You’ll try, but it can’t be the same. Don’t ignore that fact, and don’t ignore that voice floating in the air – the one that tells us we must make the most of these magnificent, moving, fraternal years. The memories are waiting. All that’s needed is you. In full. Happy holidays to you and your brothers and sisters. Thanks for reading. There are ideas in fraternity and sorority life that need to be shouted from the mountaintops. There are ideas that deserve to be studied, analyzed, explored, and shared. And there are ideas that give us hope and inspiration. And then there are these ideas. I've tried to compile a list of the most frequently recurring bad ideas that I've heard in chapter rooms all over. I don't want to castigate those who have brought these ideas forward, because most were offered with earnestness. But that doesn't make them any less bad. I believe it's time we actively seek to retire these ideas, phrases, notions, etc. We'll be a better Greek movement without them. This is a common answer to member apathy, but when implemented, makes matters worse. Same with extensive fining systems. My 3-year-old has a points system in his preschool. I hope he doesn’t have that same system when he’s an 18-year-old college student. Start modeling adult organizational behavior. You won’t find a professional workplace with a points system. If someone isn’t meeting their obligations, hold them accountable through restitution, restrictions, and possibly, removal. How about you wait until his grades are good? Unless the sign outside your house says “Academic Advising Office,” you probably shouldn’t pretend that you can make any substantial difference for his grades. In my experience (and I'm sure there are a few exceptions), fraternity can take average and above students and make them even better. However, we are terrible at taking poor and below average students and getting them to perform. When I've been asked by chapters my advice for how to raise their chapter GPA, my answer always is to recruit high performing students. If they already have that ability, then you can do what fraternities do best: teach leadership, instill values, perform service, etc. You really only need one. Don’t worry, the person who lost the election will be okay. By forcing people into co-president situations, you are not helping them. Have you ever seen one of those movies where two prisoners are trying to escape but they are handcuffed to each other? Yeah, that’s what you’re doing. Should have stopped after the second chance. Fraternity is a privilege. Yes, young adults can make mistakes. A couple bouts of idiocy can be explained and forgiven. Beyond that, it’s time to acknowledge that we can still like the guy, but he shouldn’t be a member. Yes, when "help" means not trying to solve the problem. That's what rehab is for. Or counseling. Or any professional service that you do not have the expertise or capacity to perform. As brothers and sisters, we play a key role in observing troubling behavior and identifying when to intervene. But, intervening means walking them to a center. Or picking up the phone. Get them to someone who can help them. That’s what sisterhood is for. I can translate this one for you: “Let’s build deep divisions in our chapter!” Or, “Let’s put a big fat target on our fraternity!” Or, “Let’s start killing off this fraternity slowly by eroding trust and motivation in our future members!” This one is probably the longest-running bad idea in the history of fraternity and sorority life. And the most damaging. And it doesn't become a better idea when adjectives are involved, such as "Let's haze the pledges...a little bit" or "Let's haze the pledges...lightly." Let's just not haze the pledges...at all. I bet many will disagree with my take on this one. A sober sister program seems like a great way to prevent against drunk driving. I think it’s a great way to reward thoughtlessness. 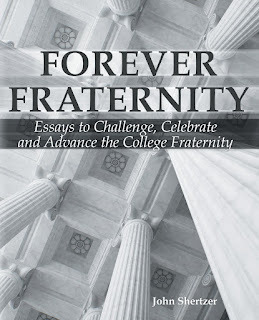 Fraternities and sororities should be the industry leaders in teaching responsibility. If a group is going out to drink, they should have thought through a way to get home safely. A sober sister program could bail out the idiots, but it also encourages them. How about instead of a “program,” we all just agree to call someone if we need them? Or change it. Or don't do it at all. The Ritual - as provided to you by your inter/national organization - is not an Instagram photo that you can crop and filter. Cut and paste is not allowed. Your full and complete Ritual is the ONLY thing truly making you a member of your organization and truly making you a brother or sister with previous generations of members and others across the country. Seek to perfect its delivery, not tweak it to fit your own needs or so you can get initiation over in time for Duck Dynasty. Let's put it this way - if you change your Ritual, or simply don't do it, then I can claim to be as much a member of your organization as you are. So can my dog. There you have it. Eight ideas that keep coming up, but should be retired. Help the fraternity movement by pushing back on these ideas if ever you hear them. I'll give you 25 points if that will help. Hurry up before your Co-President gets them!